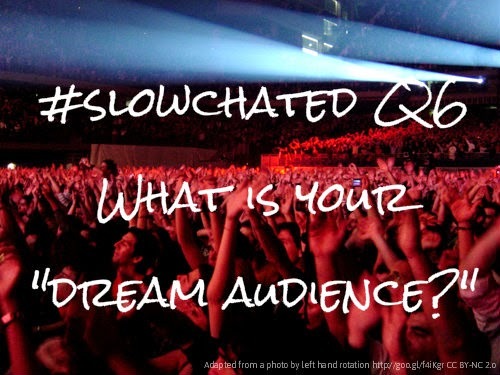 You can relive the entire week's chat with the Storify archive! From hanging work in the hallway to having my students publish their own book blog, giving kids an authentic audience has been a powerful force in my classroom this year. 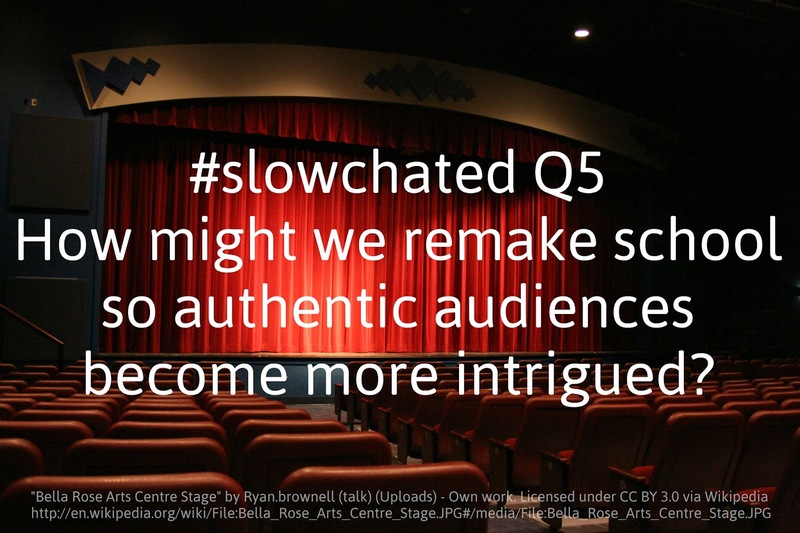 I was happy to jump in and moderate #slowchated this week to find some other perspectives on authentic audiences. 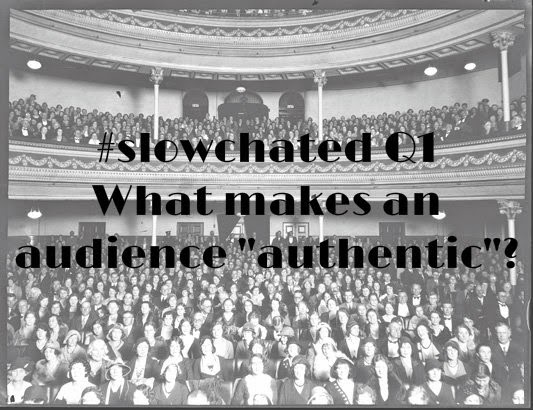 A1 #slowchatED Audience is authentic when the teacher is not the audience. Big #tlap ? if Ss did not have to be in class, would they? I've been successful at giving my students an audience they have no connection with. I often share our book blog on Twitter tagged with #comments4kids As a result, my kids have received feedback from teachers I know in other parts of the country along with others who have absolutely no connection to me or our school. When we've discussed it as a class, everyone agrees that they take more care with their writing when they are truly publishing it for the world. We don't know who will read it. I really like the idea of using people with expertise as an authentic audience. When I invited judges for my school's Invent Idaho competition, I asked a friend who is an accomplished tinkerer to view the projects. With his experience in electronics projects and scale modeling, he was able to give students feedback on their projects that I wouldn't have considered. Our district technology coach also judged. He has judged at many of these competitions, so he was able to offer yet another perspective. Going forward, I want to find more opportunities for my students to present to "logical consumers." There are so many appropriate audiences for students, the key is getting their work in front of someone. The background photo above is a poster some of my math students made after learning about scale drawings. It's been hanging in the hall facing our playground for months, giving my students an authentic audience for their work each time students go in and out the playground doors. I hadn't directly thought about the benefits of audience awareness before. But, I have seen my students go from assuming everyone knew all about the characters in Harry Potter and other popular series to understanding that they needed to provide that information in their book reviews. I think building audience awareness leads to developing greater empathy. It's definitely an idea worth exploring further. 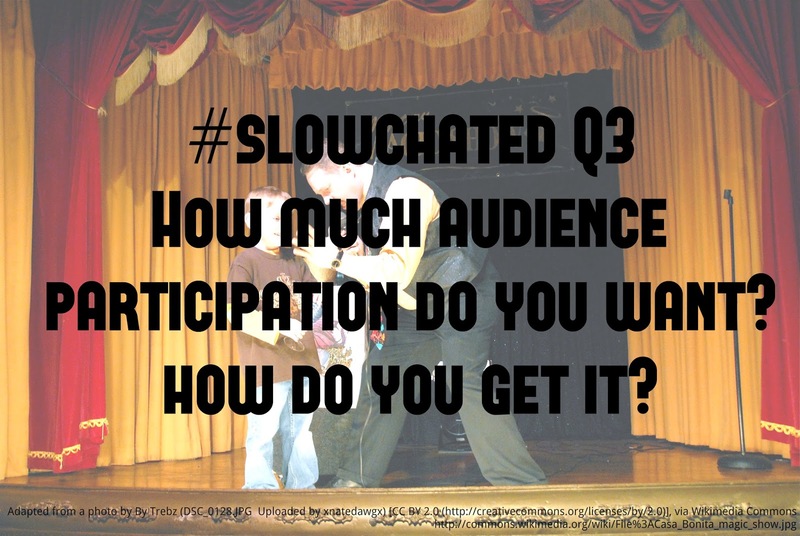 A few of our slow chatters shared some great things they've done with their students. These were two of my favorites. Please follow the links to see some great student work! Although most of our discussion was about reaching out, this was a great reminder that our classrooms have a built-in audience. 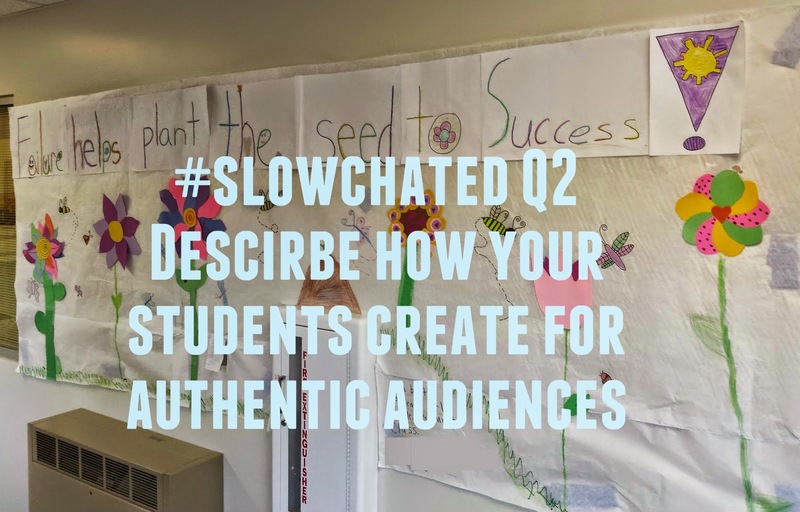 When work is shared with classmates rather than created for teacher eyes only, our students get many of the benefits of having an authentic audience. Doing it successfully, though, often requires teaching what it means to be a good audience, as described in the tweets below. I've been able to incorporate an authentic audience in my English/Language Arts classes with our book blog, but I really want to give my math students more opportunities to put their work in front of others. 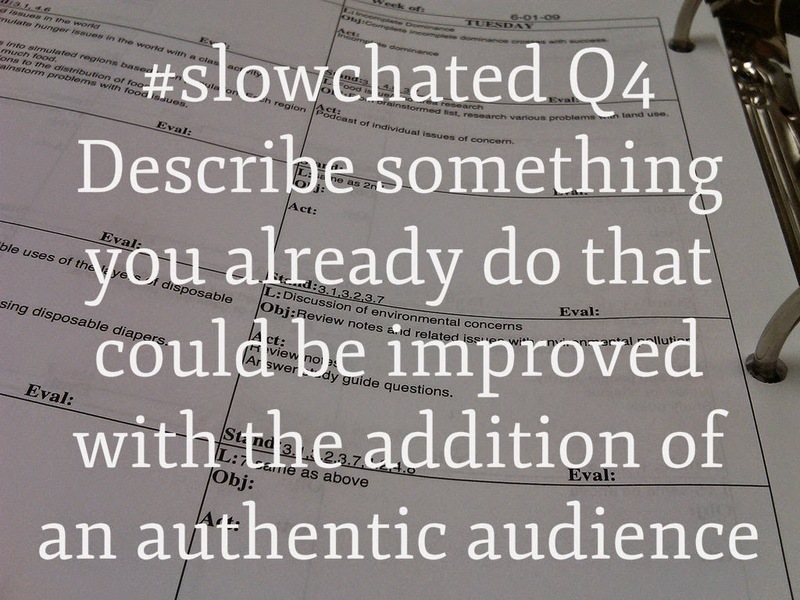 Here were a couple other places suggested for authentic audiences. I love this idea - a school so engaging that the community wants to be a part of it. By opening our doors and sharing the great work of our students, it can become a reality.